I love this NIrV Beginner’s Bible Devotional Pack! This pack contains a hardcover full-text Bible and a softcover 365-day devotional.The hard cover full-text Bible is easy to read with large print that is just perfect for kids and also lots of beautiful illustrations throughout. 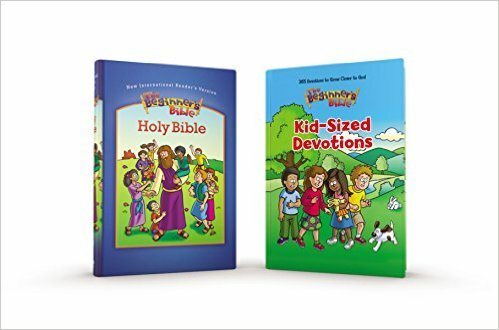 The Kid-Sized Devotions also has large easy to read print for kids along with beautiful illustrations. Each day has a theme which the Bible passage, story and art relate. My kids absolutely love this set! We read a little from the Beginner’s Bible in the morning and a day from the Kid-Sized Devotions book at night right before bed. It's the perfect way to start and finish the day and the kids enjoy our time reading Gods word together and building a strong relationship with God! By Zondervan on Amazon, Barnes and Noble and other bookstores.